KidSave’ accounts may be part of a long-term solution to the retirement income problem. In the presidential debates, we’ve heard more about Donald Trump’s anatomy than what may be the most pressing financial issue directly in front of millions of boomers: Where will they find monthly retirement income that is guaranteed for life? The retirement industry can talk about almost nothing else, which in hindsight seems a predictable turn. Did we really believe Americans would manage their 401(k) plans well enough to stash away 25 years of post-career financial security? We haven’t come close, and in this sense the 401(k) has been a colossal failure. Now the first wave of pensionless retirees is about to land, and politicians have almostnothing to say on the subject. Kerrey noted that without change every American now under age 40 will receive a 25% cut in Social Security benefits at retirement. We need interim steps. But we also need a long-term plan. The candidates have touched on ways to fix Social Security and cut ballooning student debt. I dedicate this first Frey Freyday/Word To Live By to my parents, Jim and Joan………..
par·ent (pâr′ənt, păr′-) -Parents can be any couple (or individual) that gives birth, adopts, acts as a guardian or otherwise raises a child. It takes almost no effort or care to be a father or mother. It takes lots of love, care, and attention to be a Mom or Dad. A parent provides unconditional love, guidance, listening, nurturing, protection, education, support, morals, values, resilience, commitment, leadership, humor, and ideas. Just like the child, the parent learns along the way too, they do their best. One of the hardest things for a parent to do is also the best thing a parent can do (eventually) and that’s give a child the gift of independence and eventually ‘let go’ and have faith in their child. Several years ago I lost both parents within 5 weeks of each other. Among other things, I had a bunch of things I always wanted to ask them Things like, where were they when the landed on the moon? When Kennedy was shot? How did you overcome your business challenges? What did you fear most as a parent? How did you overcome your heartattack and get back into the workforce? What would you do differently as a parent? ….and many many more things. I wanted to ask them about their school experience more, other relatives, family details, etc. Then recently I came upon this, and I wanted to share, I think it is something we never thinks about but we should.…. How do you honor people? 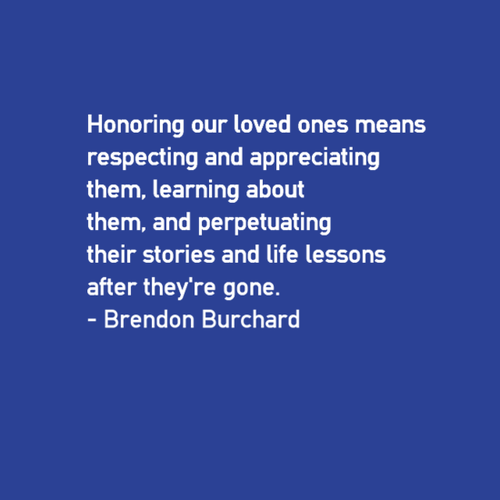 If you have loved ones who you’ve lost or you have people in your life right now who you just admire greatly, who are helping you out, who are influencing you in positive ways, how do you honor people? In our society, especially in the Western culture it’s so much about giving them gifts, pay increases or sending them stuff. But I actually want to talk about a different way that you can honor people that a lot of people from our audience who know this story always find meaningful. I think it would be so phenomenal an experience for your family members and for you in the future. They went to the doctor and the doctor said that’s weird your spleen seems to be enlarged and they did a bunch of tests and found out he had acute myeloid leukemia. It’s the kind of leukemia you definitely don’t want. You don’t want either, but that one is the one that tends to take people’s lives quickly. Dad went through a couple rounds of chemo and unfortunately they weren’t helping. They wanted to put him on a course of the third treatment but it was clear it wasn’t going to work, that would decimate his body, and he made the choice to go home and be at our house with Hospice care until the disease took him. So, from diagnosis to death we had 59 days with dad and that was it. I feel very lucky for those times. I had an amazing relationship with my dad as did my family. I love him so much and it was something that’s taken this many years to shoot a video about, because I used to not be able to control any of my emotions and I didn’t speak about it that much on stages for a long time, because it was such a huge emotional toll. One thing I was happy about that I was able to do during that time is when we knew it was bad and that we might lose him, I happened to be away traveling… I was teaching a seminar to a few hundred people and he called to let me know the second course of chemo hadn’t worked and they didn’t know how long he would have. They were constantly saying, “You have a week left, a week, ten days, three days.” It just took his body so fast because what happens is the stem cells aren’t creating the white cells correctly and the white cells start hampering the body’s ability to function. They’re mutated with leukemia and it takes over your entire body just that fast. I didn’t know if I would get to see him again or if I could get out there fast enough, so I asked him, “Dad, can I call you and interview you? I want to ask you some questions and record it.” He was in the hospital and just recovering having gone through the chemo and he said sure. I just didn’t know if I would get there fast enough. I called him back and used a free conference calling line, which you can Google and find that allows you to record. I called him and recorded it. I asked him 30 questions or so about life and I’ve posted the link to those questions [click here to get the interview guide] and I’ve formatted it in a way where you could ask anyone in your life these questions. It’s just about getting to hear them talk about what’s important in their life. What did they learn when they were young in adolescence? How did their mother or father influence them? What did they learn from their parents? What did their grandparents want them to carry on? What do they want you to know after they’re gone? What do they want your brothers or sisters to know after they’re gone? What values do they want to teach? What do they want you to remember when the times are dark? Just advice from this person that you love. It was my dad, and he gave unbelievable advice. I would say from everything I own in my life now, this is the most treasured thing I have is this recording of Dad, just him talking about life. It took me a long time to be able to listen to. If I listen to it, I completely get emotional about it, but at the same time I find it empowering and inspiring and it connects me back to him. It’s meaningful to me, too, because while you’re watching me on video now or listening to me in whatever format, in growing up, my dad, his generation just didn’t have any video. I don’t have that much existing video of my father at all outside a wedding, so this is one of the few remaining recordings I have of him. Those seven things, which were really his values and who he was in so many ways, and he said a lot of amazing things during the interview, but those things I carry with me and I’ve perpetuated over and over. I’d tell his message to all of my audiences. I’ve shared that on a quote card on my Facebook pagebefore and it literally got 40k likes in a week. I don’t know how many times it’s been shared now, but literally hundreds of thousands of times been seen by millions of people and it stunned me. It reminded me that one of the best ways that we can honor somebody is to carry forth their values but not just to communicate them, not to just live them or have them, but to share with other people. Maybe you had a grandparent who inspired you and you should tell people about that grandparent and what they told you about life and how to live a good life. I think there isn’t a lot of conversation, amazingly, in our culture broadly and at an individual level about what it takes to live a good life. People don’t talk about that as much anymore. Personal growth in terms of an industry seems to be declining, because now people can just get something for any time and everything is so immediate, less people reading books and that genre, less people engaging it seems like. I’m blessed to have so much of a wave in this area of personal development with this YouTube show being so successful and my Facebook thing taking off and email list exploding over the past couple years. I can share with you that what makes those things meaningful is trying to share meaningful advice with people, meaningful insights and I think you can do that. I think there have been people who have inspired you and the more you tell their story and tell people explicitly and directly, this is what they taught me the more we carry forth the legacy of those before us for future generations, the more we become standard bearers of what a good life is because if no one’s talking about it and if no one is communicating values as much anymore, we start to lose that. And I think what’s happened is generation after generation has failed to hold the line of high standards in humanity. We’re getting more and more lackadaisical with “anything is okay” and celebrating idiots on television, angry people or the smart bitter comment that jabs at somebody versus talking about what it takes to be a good person. What does it take to live the ideal life? Obviously I’ve dedicated my life to that. This whole thing is about living your charged life. What would that feel like?One of the things to live a fully charged life is to honor the people in your life. I encourage you to interview them and completely steal my interview form and call someone you love and interview them. I think you’ll be surprised at some of the things you’ll learn and some of the tidbits they’ll give you, you can remind yourself. I carry them around in my wallet. I think about these things because they give a guidepost of behavior everyday to live up to, to live into your highest self; to live into those ideals and values. It’s in that perpetuation of goodness that we hold the line of the best that is in humanity, and I encourage you to do that. It can be as simple as writing a letter to someone and professing to them, this is why I love you, care for you and admire you. The number one way to honor someone is to carry their voice and values forward everyday through your behavior and explicitly through stories and advice and guidance of other people. I think that’s the ultimate way to honor people, more than the fanfare of a fancy gift or if you have a great employee and giving them a raise, but to really celebrate somebody’s words and their noble character and what they have to share with other people, that is a magical way to make a difference, to perpetuate the goodness in humanity and to celebrate and honor someone who’s made a difference in your life. Like this episode? Please share it with others. Let’s inspire others to live a fully charged life. The interview guide referenced in this video can be downloaded free here.